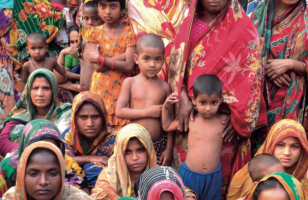 In partnership with Friendship, a NGO actively promoting access to healthcare for the most destitute communities in Bangladesh, La Chaîne de l’Espoir is providing its medical teams’ surgical expertise in various areas such as cardiology, gynaecology and orthopaedics. Examine and treat vulnerable communities on-site. Provide medical expertise by training local practitioners in new surgical techniques and arranging medical theory and practice training sessions on-site. Reinforce existing infrastructures and develop health centres. In 2014 : a paediatric surgery mission took place: consultations and operations were performed. In March 2015 an orthopaedic consultation mission was carried out by La Chaîne de l’Espoir : over 50 children were examined by Professor Jean-François Mallet, an orthopaedic surgeon. 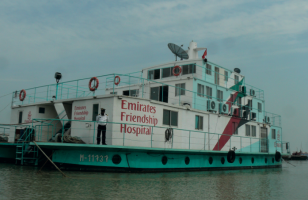 In April 2015 : a mission was organised for the rehabilitation of the Emirates, one of the three hospital ships set up by Friendship. This mission also had a second purpose: train local medical staff. Awareness sessions on sanitary hygiene were provided. In 2016 a coordination mission was organised in order to evaluate the progress of the on-going construction of the Shyamnagar hospital and needs in personnel and equipment. The second purpose of this mission was to assess the medical activity on board the two Friendship hospital ships. Finally, this mission aimed at carrying out check-ups: a total of 150 patients were examined.